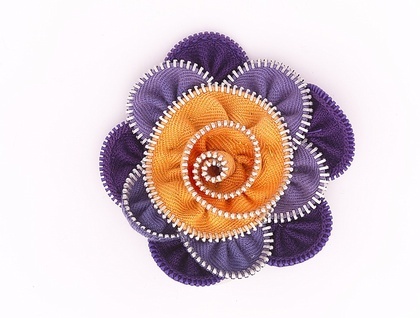 A beautiful violet and yellow flower brooch hand stitched from vintage zips. Violet lotus flower is 7cm across at the widest parts.The colours are a beautiful mix of purples in shades of lilac and violet and the centre is a twirl made from a deep yellow with silver teeth.The outer petals are made from zips with silver teeth which add a touch of sparkle. This flower is made from vintage zips carefully hand sewn together ,there is a brooch pin on the reverse side so you can pin to your favourite outfits/hat /bag/coat. Just imagine it on your favourite coat or jacket!